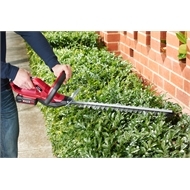 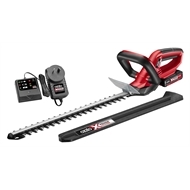 The Ozito Cordless Hedge Trimmer is ideal for trimming and shaping shrubs and hedges. 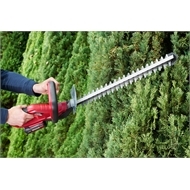 Its lightweight design and ergonomic sure grip handle ensures user comfort and allows easy manoeuvring around the garden. It is fitted with a dual handed safety switch that prevents accidental starting and a blade brake that stops the blades within one second once the tool switch has been released. This kit includes an 18V 2.0Ah battery featuring li-ion technology that provides cordless convenience and eliminates the need for long extension cords.